Relaxshacks.com: YOUR INPUT on a Micro/Tiny A-frame Cabin- that transforms!? 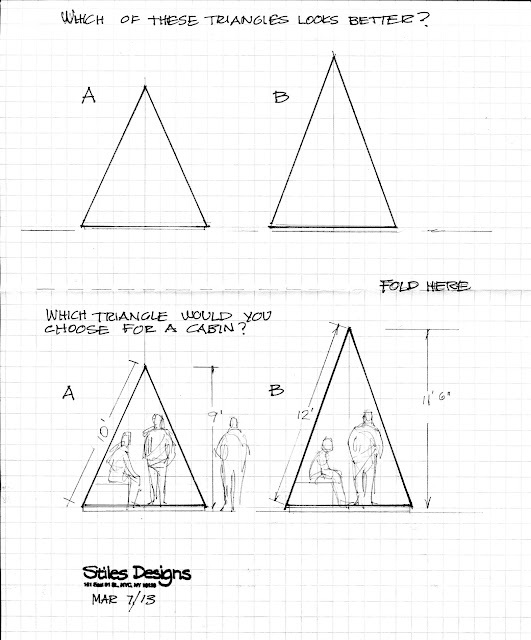 YOUR INPUT on a Micro/Tiny A-frame Cabin- that transforms!? So one of the author/architect/illustrator teams I respect the most, David and Jeanie Stiles, and a duo I own several books from, now happen to be the two I'm teaming up with for an eventual set of VERY AFFORDABLE cabin plans. By affordable, I mean not only to purchase, but to construct. When built with new materials, this cabin would cost around $1200.00 (maybe less), and easily serve as a vacation cabin for two. Before I ramble further, WE'RE LOOKING FOR YOUR INPUT, as David and I keep batting "size" ideas back and forth. Which shape do you like best? I won't tell you which one I'm for, as I don't want to cloud the waters, but I'd like to know your thoughts, initial impressions, and WHY? I think it'd be very interesting to hear from some or you, as its always good to get outside opinions. We also have a lot of real-deal craftsmen/women and pros in our midst, and who frequent our facebook groups, so why not pose this questions to some very talented and experienced individuals? Here are links to my book, and to one from David and Jeanie Stiles (they've released about 15 books, all of them very worthwhile). David n' Jeanie also were kind enough to write the new intro to my book "Humble Homes, Simple Shacks" when it was re-issued through The Lyons Press, and they were supporters of the book from very early on.